Many San Francisco real estate developers in the early twentieth century used place-making “street furniture” to attract attention and potential purchasers. Most installed simple columns with street lamps to act as gateways, but the new residence parks on the west side of town featured everything from massive staircases to fountains to sundials. In the above image, city photographer Horace Chaffee captured Department of Public Works street improvements around what appears to be a Greek temple with vases and stairs up to a colonnaded platform—all protected by a reflective diamond traffic sign. The double structure in the median is actually two pergolas, meant to be a walkway shaded by bougainvillea, roses, wisteria or other climbing woody vines. Perhaps such flowering plants had hung on the pergolas—they appear a bit worn—but were removed as part of the street work and landscaping Chaffee documented. The number of cows across the street belays any feelings of a Civic Center in the above image, and the acacia trees have not made their arrival. 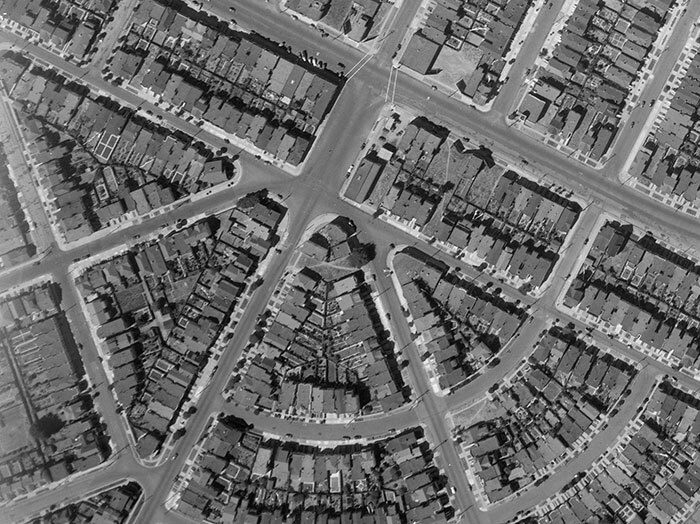 The fanned Crocker Amazon street plan on the slope of San Bruno Mountain had a few dozen Craftsman-style houses built through the 1910s, but was slow to fill. While there was nearby streetcar service, it was a long way to downtown. 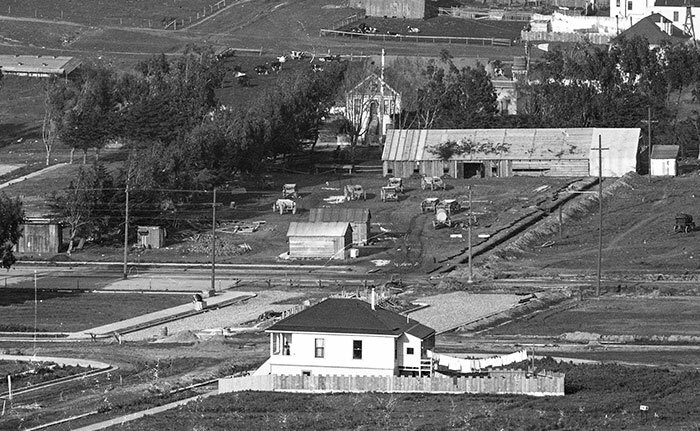 It took a booming post World War I economy and the widespread adoption of the personal automobile to start vigorous house building activity in the tract. The good news is that in 2010 the median was landscaped with seats, pathways, and a whole “Pavement to Parks’ treatment of 18 trees and hundreds of plants. Named “Naples Green,” it’s no Greek temple, but still a very pleasant addition to the former Crocker Amazon Civic Center. 1. “Crocker-Amazon Tract,” San Francisco Examiner, January 7, 1912, pg. 40. 2. “Preparing New Tract for Homes,” San Francisco Call, October 13, 1912, pg. 36.